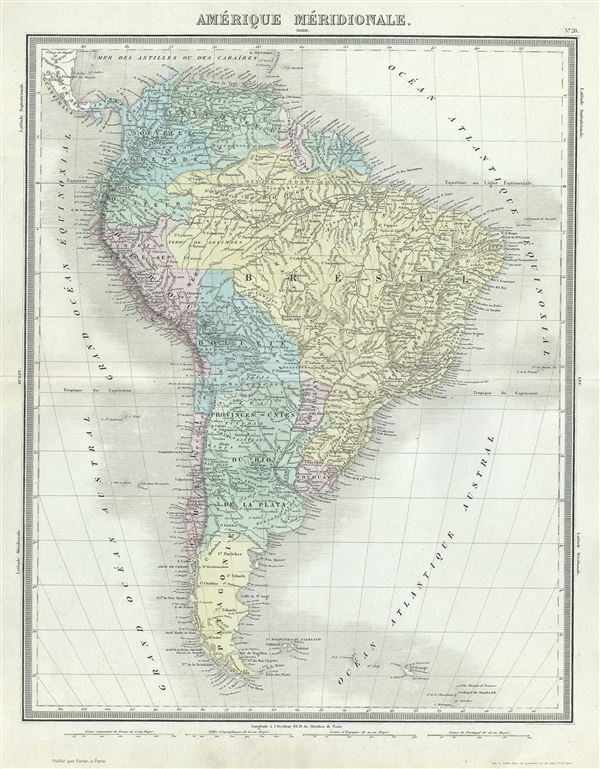 This is a fine 1874 map of South America by Ambroise Tardieu. It covers the entire continent from the Panama to Cape Horn and from the Pacific to the Atlantic. The Falkland and South Georgia island groups are included. It shows surprisingly accurate detail of the interior of Brazil and the Amazon Basin. Bolivia is shown with an outlet to the Sea and Patagonia as separate from the Argentine Republic and Chile. Throughout, the map identifies various cities, towns, rivers, islands, mountain passes and an assortment of additional topographical details. The map is color coded according to regional and political boundaries with elevation rendered by hachure. This map was prepared by Ambroise Tardieu as plate no. 26 and issued in his 1874 edition of Atlas Universel de Geographie Ancienne et Moderne.